I picked up a beauty of a shed on "April Fools Day" a couple weeks ago. Several hours of searching for the match were fruitless. Not being ready to give up, I had studied the Google satellite images trying to figure where he might have gone after dropping the first side or where he might have come from. There was an interesting little patch of brush of 4 or 5 acres nearby which he could have easily walked to or come from without really exposing himself. Surrounded by homes and some commercial buildings. Just a little pocket. I threw my boots in the car and decided to check it on the way home on Friday the 13th. Almost unbelievably, I had only gone about 75 yards into this little patch and there was the match--setting right in the open really. Left side grosses around 78" and the right side close to 73", so right around 150 gross inches of bone with no spread. Not my highest scoring set but a real beauty and a great way to finish up what was a difficult shed season. This is an Onondaga Co deer. Thanks. It’s a great pastime. Hope you pick a few this spring. Man that is a beautiful set of antlers. Shed hunting has become an obsession for me and I could only wish, hope and pray that I can find some private land to hunt. Hopefully find something this beautiful! Great find and good luck! I picked up the right side off this buck this past spring...April 2013. A guy bow killed this buck in November...might be posted on here.By the picture posted in the newspaper and all my recent game camera images of him suggest that he had gone slightly down hill but still grossed over 160" apparently. That is a great find and a huge advantage for you next season. Can you hunt that block of woods? If not you have his pattern - I'd be knocking on doors to try and get access. Best of luck if it works out I am sure he will be on here. This type of information is invaluable - hopefully he has a similiar summer pattern!!! Join in and write your own page! It's easy to do. How? 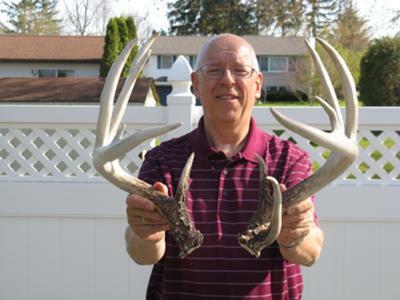 Simply click here to return to Shed Antler Photos.